For thirteen years, Ben Tomlin was an only child. But all that changes when his mother brings home Zan -- an eight-day-old chimpanzee. Ben's father, a renowned behavioral scientist, has uprooted the family to pursue his latest research project: a high-profile experiment to determine whether chimpanzees can acquire advanced language skills. Ben's parents tell him to treat Zan like a little brother. Ben reluctantly agrees. At least now he's not the only one his father's going to scrutinize. than just an experiment. His father disagrees. To him, Zan is only a specimen, no more, no less. And this is going to have consequences. Soon Ben is forced to make a critical choice between what he is told to believe and what he knows to be true -- between obeying his father or protecting his brother from an unimaginable fate. 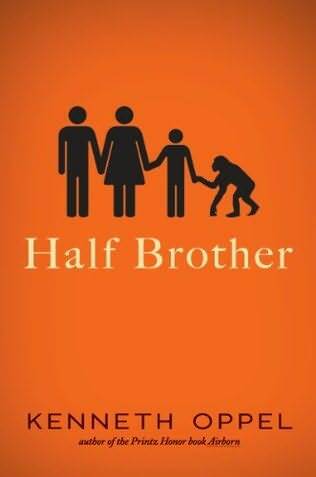 Half Brother isn't just a story about a boy and a chimp. It's about the way families are made, the way humanity is judged, the way easy choices become hard ones, and how you can't always do right by the people and animals you love. I’ve heard Kenneth Oppel’s name before in association with his award winning Arborn. He’s written numerous other books as well, including his bestselling Silverwing series as well as his follow up sequels to Airborn, Starclimber and Skybreaker. But Half Brother is the first book that I personally have read of his. And I have to say he is one talented writer. Half Brother tells the story of Ben and his parents experiment, Zan. Zan is a chimpanzee, who was brought to Ben’s house when Ben’s parents decided to conduct the experiment to try to train Zan to speak via ASL (American Sign Language). They raised Zan as a human and as part of their family. But as the experiment starts to receive criticism for a lack of results, (a situation that Oppel makes abundantly clear is at the fault of the experimenters recording rules and mechanisms) the family is forced to make some difficult decisions. But after two years living as Ben’s family, how can you just toss away your own half brother. I was expecting Half Brother to focus on an issue such as animal cruelty to a fault, but in fact Half Brother was an incredible mix of different issues and story aspects. The setting takes place in early 1970’s Victoria, Canada, and it is here that Oppel does an amazing job of introducing us to the characters. Readers will love and relate to Ben and his struggles with his friends, family, and morals, and they will feel anger, frustration, and angst whenever he deals with his control freak of a father. But what is most impressed me about the book was the level of writing Oppel demonstrates. I found myself emotionally charged by the book. I was ecstatic when Zan started signing, and I felt my chest tighten in fear and sadness when Ben and Zan had to say goodbye. All in all I couldn’t put the book down. I finished it in a day and felt content and happy. Oppel does an amazing job crafting the story and creating the characters readers will learn to love, making this an unforgettable tale. Because of all these aspects and more, I personally plan to read Oppel’s past works and would have no qualm recommending this book to anyone looking for a fun engaging read.